Are you vegan? Mint has Vegan meal prep options available. Give us a call to chat about it, we’d love to hear from you! Prepare the tomato sauce and ricotta ahead of time. In a 9X9 glass dish, coat the bottom with a little of the sauce. 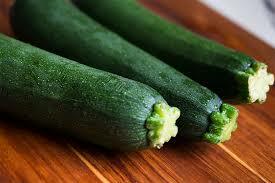 Line the bottom with zucchini slices, overlapping them slightly. Make two layers, season. Spread half of the ricotta evenly over the zucchini using a spatula. Cover with some of the sauce. Repeat layering with the remaining zucchini with the last layer ending with the remaining tomato sauce. 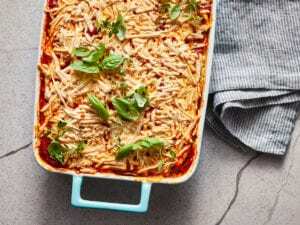 Cover top with vegan parmesan or mozzarella if desired or leave plain. Bake for about 15-20 minutes until the zucchini is just cooked through. Let cool slightly before serving or can be refrigerated and enjoyed within a week. In a sauce pan on the stove heat 1-2 T. olive oil. Sauté the onions until translucent. Add the garlic and cook 3-4 minutes, stirring occasionally until fragrant. Be careful not to burn. Season with salt, pepper + oregano. Add tomato sauce and about 1-2 T. water. Bring to a light simmer. Adjust seasonings and let simmer 15-20 minutes. Let cool slightly then add the sauce and fresh basil to a blender or food processor and process until smooth. Drain cashews, discarding the water and place all remaining ingredients into a blender or food processor, process until creamy. You can leave a little “chunkier” if you like. Taste and season to your liking with lemon, salt + pepper. Place in the fridge for about 30 minutes to an hour to stiffen the mixture or use right away if needed. Can be stored in the fridge for up to a week or in the freezer for up to 3-4 weeks. Let us know how it turned out by tagging @MintPersonalChef in your Instagram or Facebook post!